A lot of call centers still employ Versant in their recruitment application process. So what exactly is Versant and how does it work? 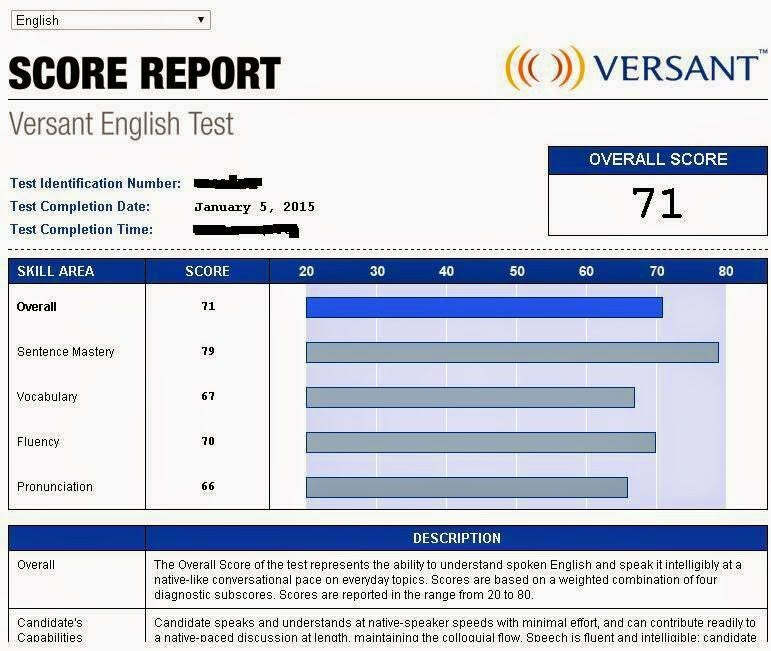 According to the website of the company that gave birth to Versant, it is an application that is designed to measure the ability of a non-native speaker of English to speak in English. I have lost count of the number of times I have taken Versant, but I don’t remember failing it for at least once. As a matter of fact, I did not find it difficult at all. In my opinion, Versant is a (stupid) piece of machine pretending to understand human speech for the fact that it does not recognize the insightfulness and intelligence of the person who is taking it. Just imagine, a machine or a robot determines your fate whether you’re going to be hired or be given a thank-you slip stating you are welcome to re-apply after a month or so. Even the recruiters know the loopholes of Versant, but it seems their eyes are closed to these loopholes and inadequacies. They (and I would like to include myself too since I am a former recruiter) are mandated to use Versant despite being in doubt of its credibility to assess human speech. I compare the mechanism of Versant to that of a videoke machine. I am not a good singer, but I can get a score of 100 on Videoke, I just need to follow some guidelines. Avoid dead air during the time I should be singing. Versant has six parts (Part A to F). You will be instructed to read sentences included in the piece of paper given to you at the start of the test. The voice will tell you to read sentence 1, 10, 2, and 5 for instance; but even if you don’t read the sentences you are asked to read, it doesn’t matter. What matters is you read something loud and there is no dead air. You just have to repeat the sentences you heard the voice say. Even if you don’t understand what has been spoken, it doesn’t really matter. Still say something in a way that you don’t sound unsure of what you are saying. Even if you say, “I’m sorry I don’t understand what you said because it was too fast.” is fine for as long as you follow the correct intonation and you don’t sound doubtful of your answer. For example, the voice says, “Andrew is thirsty, will he grab melon juice or an apple pie?” Even if your answer is “apple pie,” it doesn’t matter. Just make sure that you sound affirmative and you answer promptly. But of course it is better if you answer it truthfully and correctly. For example, “Robert believes / the difficult exam/ that he will pass.” should be arranged to “Robert believes that he will pass the difficult exam.” Again here it doesn’t matter if you are able to arrange the jumbled sentence correctly. Even if you say “Robert believes the difficult exam that he will pass.” in a manner that it sounds like it is the sentence itself, it is absolutely fine. In fact, even if you say a totally different sentence, it is OK. They are 30 seconds and 40 seconds respectively. Part E is story retelling and Part F is open question. The goal is not to be able to retell the story in 30 seconds or to answer the open question in 40 seconds but to consume the time allotted to answer. One of my friends told me that when he took the Versant at one of the biggest call centers in Mandaluyong, the recruiter instructed him to just “pray” Our Father Who Art in Heaven. The prayer itself won’t grant you a sure pass, but since it is a memorized text, you will not likely commit dead air, stuttering, and fillers. You can also recite it loud enough. The problem, however, is if the recruiter intervenes in the Versant. Everything is recorded so your response can be listened to by the recruiter especially if there are only a few people applying for that job. The recruiter will have sufficient time to listen to your recording. There are plenty of strategies that you can use in a way that you don’t appear cheating. Moreover, you can always have a pen and paper handy to help you remember the information that you heard. Ask your recruiter if you can. Apparently, Versant has a gauge similar to that of an electrocardiogram. A flat line results from dead air and you need to speak loud in order to maintain loudness that is above the passing decibel. No one knows, however, how loud is loud; but just make it loud to be sure. Don’t mind others who are taking it simultaneously with you. Meanwhile, stuttering and fillers will make the line stagger which is not in the normal pattern of speech which is smooth. “I will went to the party tomorrow.” is something acceptable to Versant since it does not engage in the grammatical accuracy of the speaker. Thanks for this helpful article. Hopefully I can pass the versant test.